Fresh Out of the Box Books! Today is World Book Night, a movement to get reluctant or non-readers a book. Started in the UK and Ireland, this is the first time it has happened in the United States. One had to apply to be a giver and chose from 30 popular titles to hand out to readers who might not otherwise have access to books. Allison Fuelling, Biology Teacher, had a personal connection to The Immortal Life of Henrietta Lacks. She had actually done experiments on Lacks’ cells. She promoted the book earlier in the year, so I knew that she had to be a giver. She applied and was able to give away copies. She loves that she is able to promote biology and non-fiction reading! 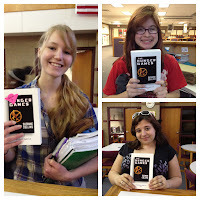 As is well established on this blog (here and here), I love how The Hunger Games inspires students to read. So many of my “non-readers” have requested this book, and it’s hard to keep it on the shelves. That is why I requested to give The Hunger Games. The atmosphere at school today is very exciting. Students want copies of these books and are so happy when they receive them. You can sign up to receive information about the next World Book Night here. It was very easy to apply to be a giver; all it took was some basic information and a short paragraph about how you could reach non-readers. Those that were selected (everyone that I know who applied was selected) chose a nearby location (book store, public library) to pick up their books. It is my hope that all of the teachers at MHS can become givers and we can make it a huge event at school. Thank you to all of the sponsors of World Book Night and to all who helped organized it. A special thank you to the East Towne Mall Barnes and Noble for specially delivering the books to school after a mix up at the store. See more pictures from the day on the MHS Library Facebook Page. Giving away books to kids is so much fun; I wish I could do this everyday!! My district is contemplating a move to 1:1 computing, where each student would have a device. In going to workshop and conference sessions on 1:1, the most challenging question seems to be which device is best. At MHS, we have narrowed the choice down to iPads or Chromebooks. Android tablets were not considered because we are a Mac district, and netbooks were quickly dismissed because of battery life and the Network Engineer’s dislike of them. A Chromebook right out of the box. At WEMTA, I attended a session by Rushton Hurley where he said that the best device is the one that does what one needs it to do. In our use of the devices, here are what our teachers and students have found: The Chromebook is easy to use, the battery is long lasting, and it has a physical keyboard. However, everything needs to be done in the cloud. If there is a slow connection, it can be frustrating to type and create because of the delays. The iPad has an easy interface for users, especially young students. There so many apps that allow for creation that are easy to use after a short tutorial. However, the expense of really good apps quickly accumulates and dealing with VPP is challenging. The iPads are somewhat fragile, and ours have easily scratched in a lab environment. The iPads are meant to be a personal device and trying to use them for more than that becomes a nightmare. MHS will be using the Google Apps for Education suite next year, and one can only create and edit a Google Doc and Google Spreadsheet on an iPad; this is very limiting. For those reasons, Marshall will most likely chose to give students Chromebooks in grades 7-12. Students in grades K-6 will probably have more access to iPads. Nicole, the first student to use a Chromebook. 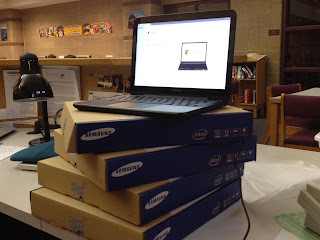 Through the library, I purchased 4 Chromebooks to let students use. I established an overnight check out procedure and policy to give students more access at home, which has become very successful. 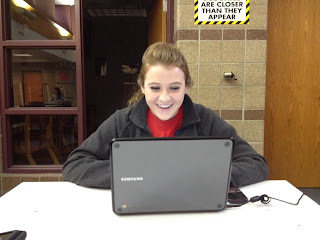 Students have really taken to the Chromebooks. They like how fast they start. So much of their work is in the cloud, that the Chromebook allows them to accomplish it. There are still many questions of how to implement the Chromebooks. How to give access to students without WiFi at home, what is the best professional development for teachers, what type of insurance should students acquire, and the list continues. Yet, this will give students access and teachers the freedom to expand projects and stop fighting over labs. There are still many decisions that need to be made, but one hurdle has been crossed by choosing Chromebooks. At the end of March, I had the privilege to attend the Wisconsin Educational Media and Technology (WEMTA) Conference. I highly recommend any librarian or technology teacher attend to gain new ideas, and more importantly, make connections. Many schools are moving toward 1:1 initiatives, and the biggest question is always “what device should we get.” One of the main points I took away from all of the speakers at WEMTA is that there is not one magical device. The best advice is what works for your situation at school. Everyone is always looking for what's next, and being a school situation, it's really not possible to keep up with the next greatest device. However that doesn't mean that schools shouldn’t try. It is the responsibility of educators to teach students how to use technology responsibly, to make global connections so that they can be successful when they graduate from high school. They need to give them opportunities to do this. I got to meet two library rockstars: Shannon Miller and Gwyneth Jones. Shannon Miller showed how she is able to connect her students globally and locally so that they had experiences outside of Van Meter, Iowa. What she's able to do for her students is my goal to do for mine. It's no longer good enough to know the next latest and greatest tool. We need our students to connect to the world. All of the spotlight presenters at the conference were wonderful and shared their resources. They inspire me to make a difference when I go back to the library. The best part of WEMTA is connecting with new people and renewing connections with colleagues that have become friends. WEMTA is an awesome place to expand one’s Professional Leaning Network and stay connected on Twitter. Many of my classmates from Cardinal Stritch University were there, and we had just a fantastic time together. Connecting over social media is a life saver, but sometimes it’s nice to connect face to face. As Rushton Hurley said, the cancer of education is isolation. Keep the connections to continue developing professionally.